Find your answers to commonly asked questions about library services, using the library and finding materials. Click on the categories below to view questions & answers. Once you are no longer registered for classes at UNCW, you will no longer be able to access our databases from off-campus. However, you can still visit Randall Library and use our Quick Lookup or visitor computers to access databases. Alumni who are no longer enrolled in courses at UNCW are eligible to sign up for a free Computer User account, which will allow access to the library’s Visitor computers. How can I donate money to the Library? Gifts to Randall Library benefit the entire University by helping us provide excellent services and materials to the UNCW community. Monetary donations (including memorials) are gratefully accepted for enhancing the delivery of library services. You can give online through UNCW Advancement (Search for "Randall Library" when designating your gift). Additional information is available at http://library.uncw.edu/about/giving_library. The library welcomes gifts of books, DVDs, manuscripts, and other materials (and monetary donations, too, of course!). Please contact Jeanne Cross at (910)-962-2271 or crossj [at] uncw.edu. To check the hours for a specific day, see the library hours calendar. Hours vary during the summer, and when classes are not in session. During the semester, access between 10:00pm - 7:00am Sunday - Thursday and 6:00pm - 9:00pm on Fridays is restricted to UNCW students, faculty, and staff. In order to use your borrowing privileges, you need to present a valid form of identification at check-out, such as the University OneCard for faculty, staff, or students, a borrower's card for visitors, or a state-issued picture identification card (e.g., a driver's license). For more information, please see http://library.uncw.edu/policies/borrowing_policies. Undergraduate students: 28 days for books from the general and juvenile collections and government documents. 21 days for books from the featured new books collection. Graduate students: until the end of the semester for general collection books and government documents. Books from the juvenile collection circulate for 28 days for graduate students. Books from the featured new books collection circulate for 21 days for graduate students. UNCW Faculty, Staff, & Trustees: until the end of the semester for general collection books and government documents. Books from the juvenile collection circulate for 28 days for UNCW faculty, staff, and trustees. Books from the featured new books collection circulate for 21 days for UNCW faculty, staff, and trustees. All others: 28 days for books from the general and juvenile collections and government documents. 21 days for books from the featured new books collection. DVDs, VHS tapes, CDs, and Audiobooks check out for 7 days for all users. eReaders can be checked-out for 14 days, but only by UNCW students, staff, and faculty. As a student in the UNC system, you are eligible for a free Cooperative Borrower's card as long as you are in good standing with your home university's library. Please see our policy page for further details and requirements. How do I get something that is checked out? Complete the login form, click "Submit," and the message displays that your request was successful. Please see our holds FAQ for pick-up information. For books, a recall notice will be emailed to the patron automatically when you place your request. The patron can use the book for a minimum of 21 days and has 7 days to return the recalled book. If the hold is placed within 4 days of the book’s loan period, the due date will not be altered. Where do I pick up things that are on hold for me? When you get an email from the library stating that your material is ready for pick up, visit the Circulation Desk and tell staff you are picking up your hold. If you are a faculty or staff member, you may request that your held items be mailed to your campus address by contacting the circulation staff at 910-962-3272. Reference materials should be used in the library; however, faculty and staff may borrow some items for a negotiated period (please check with the reference librarian on duty). Can I check out a periodical? Graduate students, faculty and staff may check out current and bound periodicals for 2 days. All other users must use the periodicals in the library (photocopiers are available). Most items checked out from Randall Library, including Interlibrary Loan items, may be returned to the Circulation desk when the library is open or deposited in one of our two item return stations when the library is closed. We have one item return box by Parking Lot D (directly beside the library) and an item return slot in the wall to the left of the library's main entrance. Items with very limited check-out periods, such as course reserve materials, and fragile or temperature-sensitive items should be returned directly to the Circulation desk whenever possible. You do not need to present ID when returning items. I am a high school student, can I use the library? Yes, Randall Library is a public facility and welcomes high school students to use its information resources in the building. View our High School Students policy for more information. Enter a library PIN up to 30 letters, numbers, or both. Do not use symbols. If this is the first time you have set a PIN, the next screen will ask you to enter the PIN twice. Your PIN is now set. If you have any difficulty, please contact the Research Help Desk at 910-962-3760.
eReaders are available for checkout to current UNCW students, faculty, and staff with a valid UNCW OneCard. You can go to the Circulation Desk and ask for a eReader. Click here to check Nook and Kindle availability. Checkout Period is 2 weeks (14 days) with no renewals and no holds. Once logged into your library record, you will be able to renew your items using either the "renew all" or "renew selected" buttons. If you have difficulty logging into your library record, please contact Circulation. Graduate students may renew books from the General Collection up to twice (allowing a continuous checkout period of three semesters) unless the book is requested by another user, reaches the highest level overdue, or the student's library privileges expire. Books from the Juvenile Collection may be renewed as per the rules for undergraduate students. Faculty and staff members may renew books from the General and Juvenile Collections until the book is requested by another user or the faculty/staff member's library privileges expire. North Carolina Resident Borrowers may renew books from the General and Juvenile Collections until the book is requested by another user or their library privileges expire. Resident Borrowers may not renew overdue material. DVDs, VHS tapes, audiobooks, and CDs may only be renewed up to twice by all users. Periodicals, reference books, and course reserve items are not eligible for renewal. To request a renewal, log on your Interlibrary Loan account, click on the transaction number of the item you want to renew, and select "request renewal" in the upper right-hand corner of the screen. Your request will be forwarded to the lending library for consideration. You will get an email with a new due date if the request is granted or a message requesting the return of the item if the renewal is denied. For policy information, please see http://library.uncw.edu/policies/interlibrary_lending. Randall Library is unable to accept replacement items in lieu of payment for lost or damaged items due to variations in format, edition, and condition, as well as associated costs of evaluation and processing. Patrons should pay any applicable replacement costs and fines. Please contact Jeanne Cross (crossj [at] uncw.edu), Coordinator of Collection Development, for further information. For more information, please see our Borrowing Policies. If items are not renewed or returned by the due date, replacement costs will be issued for items that are at least 14 days overdue. The bill will include the replacement cost and a $15 non-refundable overdue fee per item. If items are returned to the Library within two months after a bill has been issued, a waiver of the replacement charge(s) may be requested but the non-refundable overdue fee(s) will not be waived. If an item is damaged or lost, repair or replacement costs will be assessed in addition to the $15 non-refundable overdue fee. Please note that water damage cannot be repaired, and must be replaced. Please see our Borrowing Policies for more information. How do I get a book, article, or other materials from another library? Current UNCW students, staff and faculty can use our Interlibrary Loan (ILL) service to borrow items not owned by Randall Library. Log on to our Interlibrary Loan Page to create a request. If you have not used Interlibrary Loan before, click on First Time Users and follow the instructions. Current UNCW faculty, staff and students are eligible to borrow materials not owned by Randall Library through Interlibrary Loan (ILL). Whenever possible, documents are delivered electronically to your ILL account (you will receive email notification). Users can check the status of request(s) through their Interlibrary Loan account. How long can I check out an ILL? The due dates for interlibrary loan items are set by the lending library, and do not conform to Randall Library's checkout periods for items from our own collection. The typical lending period for an ILL item is 4-6 weeks, although some libraries will grant more or less time depending on their institution's policies. An item's due date will be printed on the paper strap attached to the item for customer reference. The lending library may issue a replacement invoice for any item they consider to be returned damaged. Damage can include (but is not limited to) highlighting or pen marks, coffee stains and other water damage, and torn or detached pages. Replacement invoices are the responsibility of the individual who borrowed the item, and charges are added to the user’s library account. Once these charges are paid, the item becomes the property of the user. What happens when an ILL item is overdue? Overdue interlibrary loans damage our reputation with other libraries and inhibit our ability to successfully borrow materials for all faculty, staff, and students. You will receive several warning notices before your borrowing privileges are suspended. Borrowing privileges are reinstated once an overdue item is returned unless we have received a final replacement invoice for the item from our lender. You will be notified via email when a final replacement invoice is pending. Once the final invoice is issued, replacement charges and billing fees will be added to your library account and the item can no longer be returned. At this point, ILL privileges may be suspended indefinitely. Unpaid charges are transferred to student accounts and can inhibit registration, graduation, and transcript requests. Replacement charges issued by lending libraries typically far exceed the market cost of the item, and invoices are non-negotiable. Library resource sharing staff abide by the statutes outlined in Title 17 of the U.S. Code, as well as the CONTU Guidelines which aid the interpretation of Sections 107 and 108 of the U.S. Copyright Act. This process may require the utilization of the Copyright Clearance Center and commercial document suppliers to obtain as much requested material as possible. The copyright law of the United States (title 17, United States Code) governs the making of photocopies or other reproductions of copyrighted material. Under certain conditions specified in the law, libraries and archives are authorized to furnish a photocopy or other reproduction. One of these specific conditions is that the photocopy or reproduction is not to be "used for any purpose other than private study, scholarship, or research." If a user makes a request for, or later uses, a photocopy or reproduction for purposes in excess of "Fair Use," that user may be liable for copyright infrigement. This institution reserves the right to refuse to accept a copying order if, in its judgment, fulfillment of the order would involve violation of copyright law. The National Commission on New Technological Uses of Copyrighted Works (CONTU) has developed a set of guidelines to assist libraries in fulfilling their duties while adhering to copyright law. CONTU guidelines (or the "suggestion of five") permits the copying during a calendar year of no more than five articles from a single journal title, not owned by the library, dated within the past five years. This means that the Interlibrary Loan Department staff can order a total of only 5 articles from a single journal title dated within the past 5 years regardless of how many users request articles from the same journal title. For articles obtained in excess of this number, the Library must pay a fee to the Copyright Clearance Center or must purchase the articles from a commercial vendor. Any costs exceeding $30.00USD per request are the responsibility of the user requesting the material. Interlibrary loan requests can only be canceled between the time they are submitted and the time they are processed by ILL staff. Once a request has been sent out to potential lending libraries (in status: Submitted to Lending Libraries), it cannot be canceled by the requestor. How long does it take to get an item through ILL? Items requested through Interlibrary Loan may take anywhere from a few days to several weeks to arrive depending on the item's type, availability, and the shipping method used by the lending library. Please plan for a waiting period of at least 4 business days for journal articles, and at least 7-14 business days for books. Certain material types are less-often lent by libraries (including newly-published popular fiction and recreational media), so requests for these items may take longer to fill than for other items. What kind of material can I request to borrow? Most books, DVDs, Music CDs. Dissertations/Theses and articles from journals or magazines. Course textbooks and other required course materials are not available to borrow though ILL. These items can be purchased or rented from UNCW's Campus Bookstore. What do the Interlibrary Loan status messages mean? Submitted to ILL Staff Request has been successfully submitted. required it is paid by the library up to our maximum of $30.00 USD. Information Needed from User A request for additional information has been emailed to the user. Submitted to Lending Libraries Request has been sent to potential lending libraries. Ready for Pickup Loan is available to check out from the Randall Library Circulation Desk. Received by ILL Staff Article or loan has arrived and an email notification to the user is pending. Selected for Library Purchase Request has been selected by Library Acquisitions to purchase for the collection. The item will be rush ordered and placed on hold for the requestor when it arrives. Article has been posted and ready for user to download; to view articles, logon to ILL account, select “Electronically Received Articles” from the menu and select the one wanted. Articles are deleted from the ILL server after 30 days. Checked Out Loan has been picked up by or mailed to customer. Request Completed or Expired Loan was successfully returned, or article has expired and been removed from the ILL server. Awaiting Renewal Processing Customer has requested a renewal; ILL staff will contact the lending library for approval. The item was found in our electronic holdings or open-access online; a link to the item has been emailed to the user. User or staff has canceled the request; reason for cancellation is included in email notification and available to view in user's ILL account (under "Cancelled Requests"). On the first floor of the library there are over 100 computers, including 18 Macs, for UNCW student staff and faculty use. There are also Dell and Apple laptops available to check-out from TAC and 6 iPad kiosks around the library for quick browsing. Visitors have 5 designated computers for use. In addition, TAC has specialized collaboration and video editing computers and software. Logon with your UNCW email username (without the @uncw.edu) and email password. Computers on the second floor, outside of the Graduate Study Lounge and the Quiet Study Lounge, have the Adobe Creative Cloud. What software is available on the computers in TAC? There are 11 collaboration stations located on the first floor of the Randall Library near the TAC area. The collaboration stations consist of 6 PCs, 5 Macs, and 3 scanners. They all have Adobe CS6 Design Standard (InDesign, Photoshop, Illustrator, and Acrobat X Pro) and TI-84 Plus Calculator emulator as well as access to SPSS, SAS, and various other software titles through Horizon. There are also 5 video editing stations in the TAC Area. The video editing stations consist of 2 PCs and 1 Mac with dual displays and 2 Macs with single display. All have video conversion equipment and editing software. Located on the first floor learning commons, and second floor group study rooms are large collaboration monitors. Laptops can be attached to make use of the monitors. See Group Study Room Descriptions. Located in the Pelican Gallery is a presentation station equipped with an LCD projector. Both group study pods near Port City Java are equipped with The Extron TeamWork® 601 (Collaboration station). Charging Kiosk: provides six secure lockers to store your device while it charges so you can leave your device safely unattended. The Charging Kiosk is located near the bathrooms on the first floor. Charging Area: provides four charging stations so you can charge your mobile device while working on your laptop or studying. The Charging Area is located by TAC on the first floor. Check out a portable battery at TAC. Where can you get headphones to use in the Library? As of June 2017, TAC discontinued checking out headphones due to maintenance and durability issues. You can purchase headphones from TAC Repairs. Headphones for visitors are secured to the visitor computers; available for use when using the computers. Does the library have Assistive Technology (AT) equipment? Yes, there is a workstation on the first floor of the library, in the Learning Commons. Visit our Adaptive Equipment/Software page to learn more about the equipment/software available. When you select a licensed resource from our website, you will be prompted to log in. Once logged in, you will be automatically transferred to the resource you selected. How do I use the microform machines? For instructions on how to use our microfilm and microfiche machines (located on the second floor in Government Documents) please refer to the How to use the Microfilm ScanPro 2000 and How to use the Minolta Microfilm Machine guides. When is TAC and Equipment Checkout open? Please visit the TAC help page for additional information. Equipment checkout is available anytime TAC is open. Hours may vary during finals. Are computers available for visitors or guests? 5 visitor computers are located on the first floor of the library. Visitors must register for a free account at the Circulation Desk. The session time limit on these computers is one hour, and visitors are limited to a total of two hours daily. These computers have internet access and MS Word, PowerPoint, Excel and Access software. There is no other software available on these computers. Can visitors save or download materials on the visitor computers? Visitor computer users can save materials either by emailing to your personal email account (ex. Yahoo, Gmail, etc.) or by saving to a CD ROM or flash drive (you will need to bring your own). Visitor computers are not equipped with floppy or zip drives and do not allow downloading software. Can you get wireless access if you are not affiliated with UNCW? Yes. Just select “seahawkguest” from your wireless connections on your laptop. Read more about wifi access. For visitors from affiliated institutions, you can select the eduroam network. Use your home institution credentials to login and get internet access, as well as access to library resources. Photocopiers are located on the first floor of the library in the Learning Commons. There is one coin operated copier located in the Learning Commons ($0.10 a copy). All other copiers require a UNCW One Card or visitor card. They can be found in the Learning Commons. Copying charges are .15 per page (coin copier), .10 per page (visitor card) and .08 when the UNCW One Card is used. You may deposit money to your card in the library at the Value Transfer Station. UNCW patrons can add money to their UNCW One Card online and can use iPrint money for photocopying. One Minolta Microform copier ($0.10 a copy) and Two Digital Microform Machines connect to iPrint are located on the second floor near Government Documents. High-volume copying (as opposed to smaller printing needs) may also be done the iPrint Business Center, located in the back of Randall (near TAC), for B&W 1-2 pages $0.27 per side, 3+ pages $0.10 per side; Color $0.45 per side. You can make color photocopies using the iPrint copiers on the first floor of the library. Two copiers are located in the Learning Commons. These copiers require a UNCW One Card, but visitors can make color copies using the visitor copier/printer with their visitor or guest printing card. Copying charges for a color photocopy is .40 per page for UNCW One Card users and .50 per page for visitors. Color copying is available at the iPrint Business Center, in the back of Randall (near TAC), for .24 per page. Copying charges are $.15 per page at the coin copier and $.10 when the visitor card is used. UNCW students can use their iPrint money to make copies for $.08 per page. You can install the iPrint drivers on to your personal computer and then choose "iPrint" as your printer. To download the drivers and for more information please visit UNCW's How do I Use iPrint webpage. Visitors must purchase a copy/print card for $2.00 at the value transfer station near the Circulation Desk. Visitors must also add money to the card before using the Visitor iPrint station. Printing costs are $.15 per page (b&w), $.50 per page (color). The print station is located next to the visitor computer area. Instructions on printing are available at each visitor workstation. Is there color printing in the library? Color printing is available from all iPrint stations. You may choose to print in color from any of the library’s computers, including those for visitors. When sending the print job, select the COLOR print driver (the default is the B&W driver). Pick up your print job. Color copies cost .40 cents/page for Students, Staff & Faculty. Visitor printing costs are .50 cents/page for color. To print a document from Blackboard, you must save the document to the desktop, open the file, and print it from there. Option A: You can purchase a visitor or guest print card for $2.00 (plus at least $1 deposit for printing) at the Value Transfer Station located on the first floor of the library (near the Circulation Desk). Print jobs must be sent to the visitor printer. Color prints are $.50, and b&w are $.15. The Visitor printer only prints double-sided. In order to change this setting you must go into MS Word and select: print properties – binding – print type – single sided. Option B: You can save your work to the Timmy drive. Option C: Students, Faculty and Staff can check-out flash drives at TAC to save their work for later printing. Option D: Email yourself the documents for later retrieval. Option E: Print jobs remain in the iPrint queue for 24 hours. You can pick up job from any iPrint on campus once you have retrieved your UNCW ID card. Option F: Go to the iPrint Business Center in the back of Randall (near TAC) where you can pay with cash, check, or Seahawk Bucks to print or copy. Color prints are $.24, and b&w prints are $.05. There are 4 scanners in the Learning Commons, and additional scanners by the TAC, freely available for student, faculty, and staff use. These scanners are each connected to computers allowing you to save, print and edit your scans. There is also a “quick scan” computer station located by the bank of iPrint printers on the first floor. For more information, see the Auditorium policy statement. Learn how to search for articles at Get Started Researching. Search the library catalog for the *journal title* (not the article title). This will tell you if the library subscribes to the journal in print or online. If we do not subscribe to the journal you will see a title browse list, with the text “your entry __________ would be here”. You can place an Interlibrary Loan request for articles in journals we do not subscribe to. If we do subscribe to the journal it may come in several different formats: microfiche, microfilm, current periodicals, bound periodicals and full-text online. Go here to get help with searching for books and other print resources through the library catalog. The catalog is a searchable list of everything that the library owns, except for articles. For help finding the item you want, go to "Where do I find books, DVDs, and other materials in Randall Library?" First, search for books, DVDs or CDs in the catalog. (For help with the catalog, go to how to search the catalog. If you need an article, go to the section on finding articles.) Note the location, call number, and status of the book or other item you want. If the item's status says it's available, you can check it out. If the status has a date listed under it, the item is currently checked out. is located in the General Collection (neighborhood) and it's call number is HQ784.T4 C512 2007. The call number is like its address (shelf HQ784) in the General Collection neighborhood. You can click on the link under the "location" of each item to see a map of that location in the library. In this case, the General Collection map shows that it is on the 2nd floor of the library. Books might be in the General Collection, Reference Collection, Featured New Books, or Government Documents collections. Media materials are located in the DVD, VHS or CD collections. For maps of the library to help locate these locations, click here. Where do I find older copies of the University catalogues and the UNCW Yearbook (The Fledgling)? The Fledgling is available in a number of places, including the Reference collection (1951-1987), General Collection (1958-1987), and other copies available in Special Collections and Archives. The UNCW Catalogue is available at various locations including: at the Circulation Desk, in the reference collection, Government Documents, and Archives. 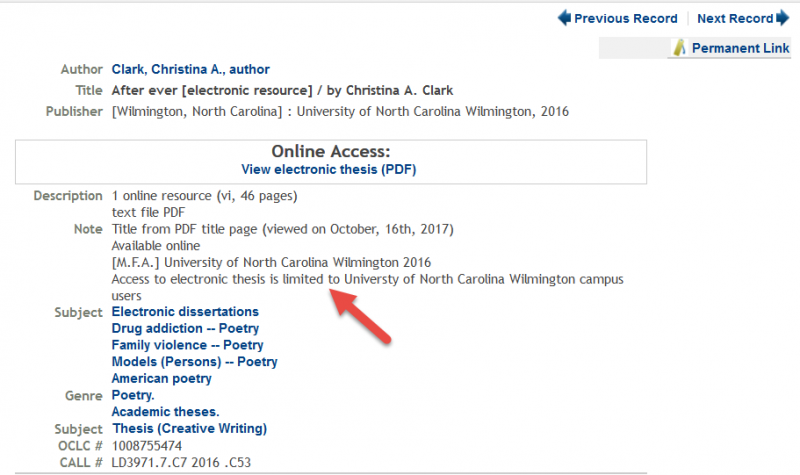 You can search the library catalog using the "Title" tab and search for "University of North Carolina at Wilmington catalogue." You can search the library catalog using the "Title" tab and search for "Fledgling." There are plenty of film scripts and screenplays that are part of the general collection. To find these, perform a subject search in the library catalog for “Motion Picture Plays.” This action will bring up screenplays in the General Collection and Special Collections. How do I find Honors Projects? The Honors Papers can be searched in the catalog with the Subject Heading “Honors Paper.” Visit this page for a search box. For the most part, they are shelved together in the call number starting: LD3971.7 H6 on the wall outside the Honors College (2nd floor of Randall). Some earlier papers are only available in the University Archives. E : Easy (Picture) books: Arranged alphabetically by author's last name. B : Biography: Arranged by the last name of the person the book is about. Fic : Juvenile Fiction: Arranged alphabetically by author's last name. J : Non-fiction: Arranged by Dewey Decimal Classification. Why is my recently submitted thesis or dissertation not available yet? A UNCW thesis or dissertation is submitted as an electronic document, then the Dean of the Graduate School must review, approve, and sign it. Once the Grad School has aproved and accepted all of the theses and dissertations submitted in a semester, they provide the electronic copies to the library. The library will then add these electronic theses and dissertations (ETDs) to their web server, and catalog each thesis and dissertation. The entire process from submission to cataloging can take several months to complete, and the steps are necessary to ensure that the theses are available and accessible to the research community. If you have a specific question about the status of a thesis, contact Gary Moore at mooreg [at] uncw.edu. Since 2008, UNCW theses and dissertations (ETDs) have been electronic only, as required by the Graduate School. They are accessible through the library catalog. Those published before 2008 are in hard-copy printed format. They may be checked out from the library’s General Collection, with a second printed copy in University Archives. 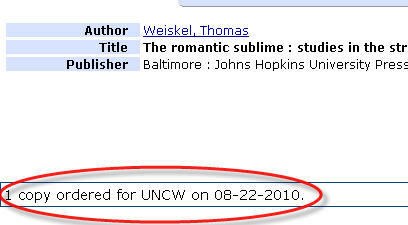 Some UNCW theses and dissertations are limited to on-campus use only, as indicated by a note in the online catalog record. Go here to get help with finding audiobooks. How do I find foreign language audio recordings? The best way to search for foreign language audio recordings is by searching the library catalog using the subject tab. Then search: Sound Recordings for English Speakers ______(list language here). DVDs are located on the first floor of the library (view map) and VHS tapes are located on the 2nd floor (view map). To find a specific video, note the location, call number, and status. Click on the location link to see a map of that location. Your Interlibrary Loan username and password are the same as your UNCW username and password. If you have forgotten either of those, visit this page. How does the LC call number system work? See the Library of Congress Classification System (LC) guide. The General Collection is on the second floor of the library. See the map. Records with the Location UNCW A/V Phonodiscs are located in the Technical Services area and on shelves beside the Conference Room. Any staff member can access this collection and pull records for students to check out. Cataloged Special Collections records have the location UNCW Special-Sound and an LC Call Number. Most of the records in Special Collections are not in the catalog and are in the Popular Music on Vinyl (LP, 78’s, & 45’s) database. They will have a call number that reads Shelf No or Album ID. Students wanting one of these categories can come to Special Collections and we will get the record. The paper version of the BD-119 was last printed 2012-2013 and is available for students, staff and faculty to check out. It is on 2 hour reserve at the Circulation Desk, listed under the course name "Faculty Staff." For more recent information, The Raleigh News and Observer maintains a searchable database. When is Port City Java open? Visit Campus Dining - Port City Java for more information and for exceptions to the above hours. If you are not a UNCW student, faculty or staff member, you can use the Visitor's Lot (Lot M) located off Riegal Road and Price Drive (near the intramural fields). There are also a few metered spaces in the lot on the north side of the library (Lot D) off Randall Drive. More information on parking can be found at http://uncw.edu/parking/visitorparking.html. Visit this page to request a PIN reset. An email will be sent to your email address with a link that will allow you to choose a new library PIN. Your Library PIN will allow you to View your Library Account and renew items. A courtesy phone is available in the lobby of the library. View Map to locate the Tech Enhanced Collaboration Space (TECS), Room 1045. They are available for reservations by UNCW students, staff, and faculty for up to 2 hours a day. Please read our Group Study Room Use Policies for more information. How do I reserve meeting/other space in the library? The library has very limited space available for meetings and other space requests. Please see our policy regarding Facility Use in the Library. Please contact our Facility Coordinator at rlfacility [at] uncw.edu (rlfacility)rhodesc [at] uncw.edu (@uncw.edu) or 910-962-7474 to see if we can accommodate your needs. For more information about whom to contact about reserving rooms on campus, visit the Campus Reservation System (CRS) webpage. To request exhibit space, please fill out this form. Please review our Public Programming and Exhibits Policy. Please submit your request as early as possible. Our exhibit spaces are usually reserved 6-12 months in advance. How do I make a suggestion/complaint? Please fill out this form and choose the appropriate category. We'll get back to you as soon as possible during normal business hours. We frequently get complaints about noise in the library. Sometimes they relate to the coffee bar, or to staff providing service at the desks, but most often they relate to library users being noisy in the study areas. We try to provide appropriate environments for a variety of types of learning, including dialog or group study as well as individual reading and contemplation. We have designated the second floor of the library as a noise free zone. What can you do if there is noise in a "noise-free" zone? You can ask the person to be quiet. If you are not comfortable with that, or they don't respond favorably to your request, please tell a staff member and we will go "shush" them.